The second wave of Empire Strikes Back action figures is, like the first wave, fairly democratic, containing an assortment of figures culled from various settings/character classes from across the film, rather than focusing on one particular area. There's two main characters (new versions of Han and Leia), one from the Bespin setting and another from the Hoth setting, one bounty hunter (Dengar), an alien (Ugnaught), a droid (2-1B), three troop builders (AT-AT Driver, Imperial Commander, Rebel Commander) and one Lobot (Lobot). Somewhat curiously, there's no Luke in this wave, but with only two major costume changes in the film apiece (Hoth & Bespin), it was inevitable that the main trio wouldn't all appear in every wave (later lines in the Power of the Jedi relauch would get much more specific, featuring things like Luke-on-Dagobah, which is his Bespin gear but without the jacket, or a Bespin-escape Princess Leia, which is essentially her Hoth outfit without the vest, to add more figures for the trio into each wave). Of this particular batch, the only figure I ever owned was the AT-AT Driver, and I'm fairly certain I picked him up at a thrift store or garage sale, and not carded. 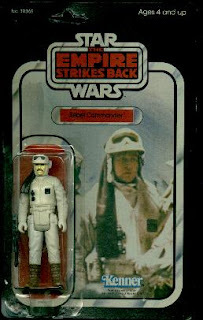 Given his general resemblance to a basic Stormtrooper, more often than not, he was used as such during play, while the blaster rifle he came packed with would often get pressed into service by my Hoth Rebel soldier posing as Hoth Luke. 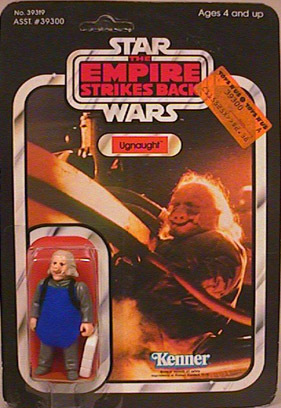 Hearkening back to the Star Wars Jawa figure, the Ugnaught figure comes with a soft-goods apron. The card for the Imperial Commander features General Veers, the Imperial officer who led the assault on Hoth, despite the fact that Veers' attire is subtly different than that of this figure and the trooper it represents, gray-green instead of deep black, with Veers a representative of the Imperial Navy, while the generic Imperial commander represents an officer in the Stormtrooper corps. 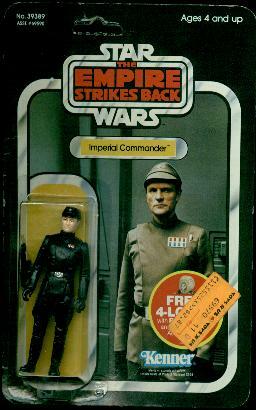 There were also several variations of head and body sculpts to the Imperial Commander, which no doubt added to their playbility and appeal as troop builders. The Rebel Commander comes packaged with a blaster rifle, but also has a backpack sculpted onto his back. The on-set 2-1B never had legs, so, as with some of the Cantina alien figures in the Star Wars waves, Kenner was forced to make up their own leg design when creating the figure. 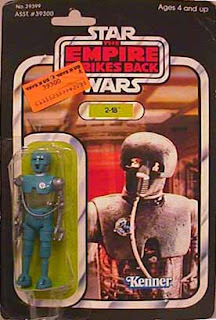 Thanks again to RebelScum.com for the action figure pics!